As his final effort showed, Philippe Gilbert had huge motivation to take yesterday’s stage victory in Paris-Nice; the win would have been his first in the rainbow jersey of world champion, and it would also have underlined how much better he is than this time last year, when he was a pale shadow of his usual self. Gilbert looked to be threatened by the very rapid French sprinter Samuel Dumoulin, who jumped off his wheel and drew alongside him in the sprint before the Belgian rallied and pulled ahead again. However seeing off that threat wasn't enough; on his left hand side, the Frenchman Sylvain Chavanel (Omega Pharma Quick Step) surged with impressive speed and blitzed past to grab the win. 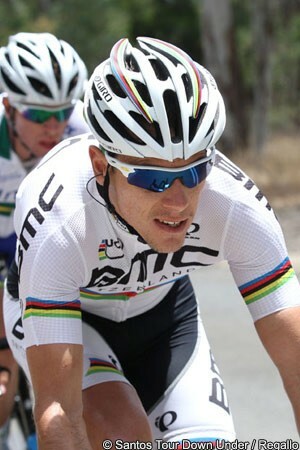 Gilbert is known as a puncheur, an explosive rider, rather than a sprinter. He seldom wins from large groups, tending instead to do so from solo moves, small breaks or on uphill finishes. Gilbert clearly wants a victory, but today’s concluding Col d’Eze time trial won’t suit him. However he has the consolation of knowing he is in fine shape heading towards Milan-Sanremo, a race he has performed well in with two third places, but is yet to win. As a result he will be highly motivated for the race, particularly as winning in the rainbow jersey is a rare, and thus particularly meritorious, achievement in the sport.